1 The Selkirk Settlement was now the Red River Settlement. The Scottish settlers lived in peace. Nearby was a Métis settlement. 2 In the 1860's, things began to change. New people came to Red River. They did not like the Métis. They wanted everyone to be English. They wanted the Métis to change. 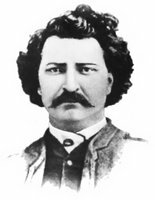 3 Louis Riel was born in the Red River Settlement in 1844. He was a very smart boy, but he was moody. He was sent to school in Montreal when he was 13. He left school when his father died in 1864. 4 At first he stayed in Montreal. Then he moved to Chicago and Minnesota. Then in July of 1868, he went home to Red River. He quickly became a leader amoung the Métis. 5 That same year, the Hudson's Bay Company sold Rupert's Land to Canada. Manitoba was part of Rupert's Land. The Métis were concerned when surveyors came. 6 The man in charge, MacDougall, did not like the French or Métis. He wanted his men to lay out the land as the British did, in square lots. The Métis had divided their land as the French did. The French used long, narrow lots with one end on a river or lake. It was called the seigneurial system. 7 The Métis were afraid the surveyors would take their land. Until this time, a council had been the local government. MacDougall was not able to take over yet. Riel became the leader of the new council for both Métis and English settlers. 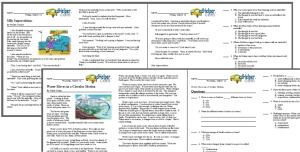 8 He helped decide the terms for the people in Red River to become part of the province of Manitoba. Most of the people were happy with his leadership, but a few were not. 9 Some of those who were not happy with Riel's leadership did not like Riel. They did not like him, his race, or his religion. One of those men was Thomas Scott.